A good stereo microscope is required during evaluation of crystallization experiments in order to distinguish between amorphous and crystalline specimens. 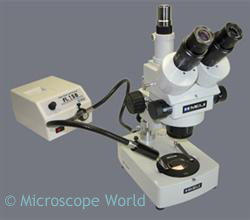 A typical microscope setup would consist of a zoom stereo microscope with a cross polarizing attachment and a minimum of 10x magnification. Higher magnifications are ideal for easy detection of small microcrystals. One of several protein crystallography microscope packages sold by Microscope World. Protein crystallography microscopes are used to look at properties of crystals such as birefringenece (or double refraction) and for identifying conditions that cause precipitation or crystal growth. When identifying crystal growth, a polarizer would not be used because the color of the precipitate is a crucial indicator. The microscope shown above uses pseudo-darkfield illumination and a dual-arm adjustable self supporting fiber optic illuminator. This allows top illumination from various angles and provides better light for examining crystals.